This certainly beats most of the other stuff I’ve had sent to me lately. Thank you TRD! And thank you Merrriam-Webster for using my sentence. 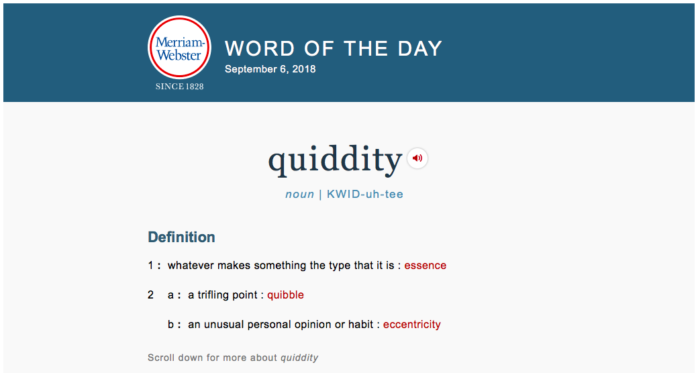 “Quiddity” — Word of the Day, September 6th, 2018. That article, incidentally, which discusses the difference between mezcal and tequila, was part of a monthly series I once wrote for the Coloradoan newspaper. If you don’t want to deal with their fireworks display of pop-up advertisements, you may read it here on my website. I always thought that along with the heartbreaking beauty of distilled spirits, it was one of my better efforts, which I know isn’t saying much.